A tenuous peace has taken hold in Libya’s southwestern city of Sebha more than a month after tribal clashes killed at least 70 people, with tensions still high between communities living here, many of whom have their own armed militias, according to local residents. The latest clashes erupted in March between the Tubu ethnic group and the Arab Awlad Sulayman and Awlad Abu Seif tribes. The clashes are said to have begun after a man belonging to the Abu Seif family was killed allegedly by the Tubu. But other narratives suggest the conflict followed a dispute over several million dollars which the ruling Transitional National Council (TNC) was planning to spend in Sebha. The violence went on for six days until the TNC brought in forces from the north to quell it. The Tubu also clashed with other communities in February at the oasis of Kufra. TNC forces have brought some semblance of peace to Sebha, but most tribal groups still have their own militias. Wanees Abu Khamada, head of the Special Forces and military governor of southern Libya, told IRIN the military recently banned people from carrying weapons at night. However, no process has yet been established to take back the weapons. Despite the presence of the military, residents of Sebha are apprehensive. Adam Ahmad of Tayuri said the ceasefire between the two groups was an “obligation”, and many were afraid of what would happen if the army pulled out. “Fighting has ceased, but we don’t know for how long,” said Al-Zarooq from the local council. 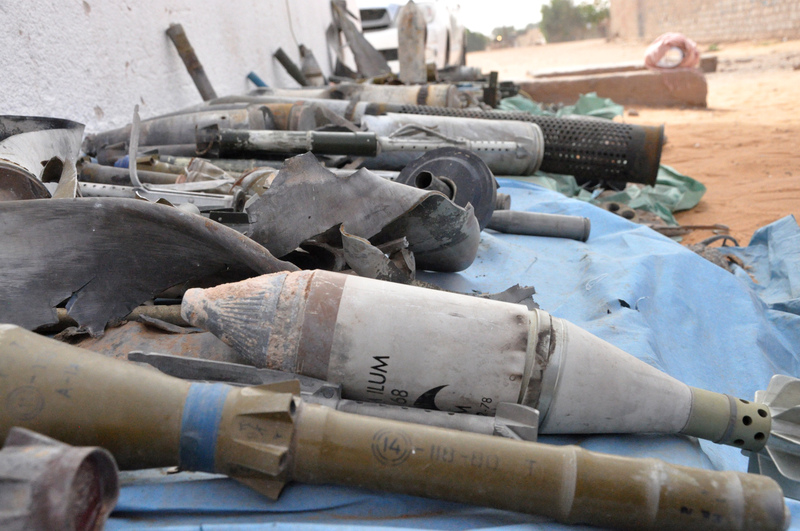 Outside the camp council of Tayuri, an assortment of weapons, including mortars, rockets, artillery and unexploded munitions lie scattered on the ground. In nearby Al-Hijara, charred remains of abandoned houses and cars stand testimony to the destruction wrought on the neighbourhood. Ali Mohamed Boubacar Julwar, a teacher who fled Sebha for the southern town of al-Qatroun, came back to find his family gone and his house destroyed. The Tubu, an indigenous black African tribe, live in southern Libya, along the Tibesti mountain range, and in Chad and Niger. While some Tubu from Chad were encouraged to migrate north to work in the oil industry under former president Muammar Gaddafi, many indigenous to Libya experienced marginalization and exclusion by the same regime and took up arms on the rebel side during the 2011 uprising. Those living in Kufra in the southeast had their identity cards and passports withdrawn under a 2007 policy aimed at deterring more of them from entering Libya and authorities in the area were told to treat them as foreigners. “The nomadic nature of the Sahara desert tribes and the fact that they have extensions in neighbouring countries were reasons for the previous regime to deny them their rights,” Adam Ahmad, a Tubu leader and head of Tayuri camp council, told IRIN. During recent clashes, local perceptions of the Tubu as outsiders fuelled the violence, as residents in Sebha unrelated to the initial disputes were urged to take up arms against them. The discourse over who is truly Libyan and who is an outsider underlies multiple conflicting accounts of the Sebha clashes and larger identity politics in the region. The city, home to about 210,000 people, has long served as a hub and transit point for migrants entering the southern borders, often illegally, from Niger, Chad and other countries. As increasing numbers of Tubu arrived in Sebha to support their people during the clashes, the conflict escalated, and xenophobic fears of foreigners led to some cases of arbitrary arrests of African migrants from neighbouring countries like Chad. While the Awlad Sulayman express fears of a Tubu takeover, the Qaddadfa and Awlad Sulayman are among the most prominent tribes in Sebha. Many of the latter were allied to the Gaddafi regime, while others fought on the rebel side during the uprising. In the four months after Sebha was liberated, residents of Sebha allege that Awlad Sulayman militias took control of the city and that crimes were committed. Members of the Awlad Sulayman were reluctant to talk to IRIN about their involvement in the conflict or to give interviews with those whose relatives were killed. Ayoub al-Zarooq said the Awlad Sulayman may have their own ambitions to assume control of the area around Sebha. “Many of the militias are from Awlad Sulayman. The street talk is that they want to control the city and perhaps even the south of Libya,” he said. It is difficult to say who truly holds power here, according to Bill Lawrence, director of the North Africa Project of International Crisis Group (ICG). "Certain districts in and around Sebha are controlled more by one group or another, and certainly Awlad Sulayman have had the upper hand, but I would not say that one or another group truly holds power, especially after the revolution which made things murkier," he said. Adam Ahmad of Tayuri local council said much of the southern border region is controlled by the Tubu, but that the Awlad Sulayman may also have their own trafficking routes. Al-Zarooq said the borders presented the greatest security challenge to the southern region, and stability in Sebha would largely depend on securing these regions. "Stability depends in part on dialogue between the communities and the ability of leaders to avert the worst," ICG's Lawrence said. "Eventually, the overall stability of Libya and these regions will depend on issues of legitimacy and governance and service delivery." The government has said it will investigate the Sebha clashes, but military governor Abu Khamada said it will take time and facts are hard to gather. Meanwhile, the residents of Al-Hijara are still waiting for justice. Yusuf Said, a young Tubu who said his mother was killed in the local hospital during the conflict, believes the Tubu must be ready to defend themselves again. “We consider the war is not over,” he said.